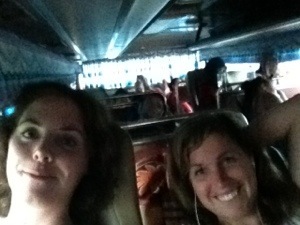 We boarded the bus in Luang Prabang at 6pm, with the intention of reaching Hanoi at the same time the following day. I was dreading the journey from the initial point of buying the tickets but knew it was my only option (there are no trains in laos and a flight would have cost around 200 euro). Plus, I figured, its just one of those things you have to do in Asia. We climbed abroad, located our seats and tried to get comfortable, all the while to thumping techno music blaring out of the speakers. And I mean club loud blaring- was this a party bus I had mistakenly booked? 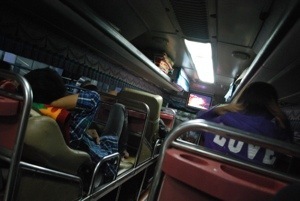 I looked around and saw mostly Vietnamese passengers, an elderly man, and a couple backpackers- probably not. Hopefully they shut it off soon. Well they didn’t. The music continued to blast for the next hour an a half, alongide Victoria’s Secret Fashion show playing on a small screen at the front of the bus- a distraction I warmly welcomed as my only other option was to listen to my ipod or sleep- no reading for me on this journey for fear of motion sickness. The music finally cut off and we pulled over to a shop/restaurant for our dinner/bathroom/snack break. Feeling slightly nauseaus already from the ride, I forgoed dinner ( the ‘restaurant’ looked more like the driver’s friends kitchen) and stretched my legs. I didn’t even buy water as I was afraid of the torture I might have to go through in the middle of the night, desperately needing the bathroom and being forced to climb over my sleeping neighbors to ask the bus driver to stop on some dark back road. No thanks. We climbed back on the bus and drove on, only to stop an hour later, just as everyone was getting to sleep, for the crew to mysteriously stop in the middle of nowhere and begin to pile large stacks of plastic bags (containing who knows what) onto the bus. Noisely I might add. And it took about an hour. What was in those bags, where they got them, and what they were for- I still don’t know. The rest of the night passed by with bouts of bump induced shocks, snoring, sleeping and swerving. I was especially fond of the Vietnamese man sitting across the aisle from Amy and I, who continuously coughed throughout the night (Some of you reading this might already know that I inherited a genetic pre-disposition from my father of intolerance towards any and all coughing), in our direction without covering his nose. Btw, as I write this, I have a cold. 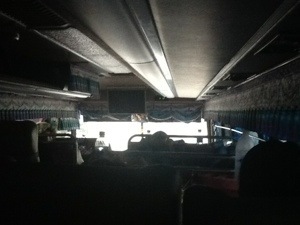 We were awoken in the early hours by the crews’ shouts to get off the bus and collect our bags. 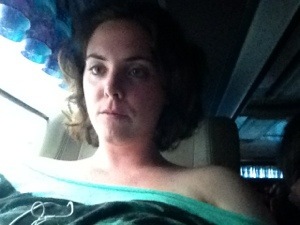 Groggy and Grumpy, I filed out of the bus only to realize we were now at the Vietnam border. The border crossing went smoothly, if not swiftly, and we hopped back on board the bus. The next, and only stop that day, was at another random woman’s kitchen to which the Vietnamese passengers were welcomed and fed while I was left moneyless (without dong and they wouldn’t accept any other currency, of which I had numerous) and hungry and then laughed at by the staff in a cafe up the street when I enquired as to whether they would accept my money. A young Vietnamese guy quietly slipped onboard, handed the driver some money, and proceeded to offer us a sales pitch to take his shuttle van fom the bus station into the centre of Hanoi, if 8 of us came it would only be $2 each (as opposed to the $25 regular taxis would apparently charge us), and faster than getting a taxi. 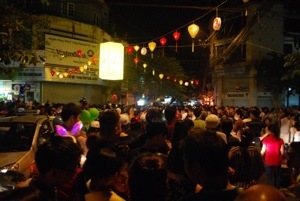 After much group discussion we consented, only to emerge into the most incredible traffic I have ever seen, complete with a Vietnamese full moon street party in full swing. It took us two hours of crawling through traffic at the slowest snail’s pace, sometimes actually stuck in places for up to 20 mintues, to finally reach the driver’s office- oh ya, he actually refused to drive us to our hostel! We filed out of the bus, sweaty and disorientated, hauled our backpacks onto our tired backs and studied our map to try to figure out where our hostel was. 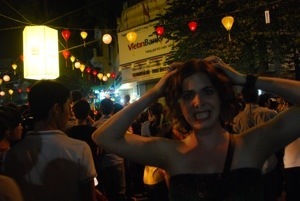 We set off down the street with a couple other backpackers, who lucky bastards, encountered their hostel after about 5 mintues, while we had to continue to weave, push and navigate the manic streets of Hanoi for the next 30 mintues to find our hostel, conveniently located on the exact street where the party was thriving. We eventually spotted our hostel’s sign down the street, reached it about ten minutes later, and heaved hugh sighs of relief through our exhaustion once inside the doorway. We made it. I think this photo accurately depicts my mood during the entire ordeal. Suffice it to say it was an experience, one that Amy and I will always share, and can look back at somewhat fondly and definitely humourously. Lets just hope we don’t have to do it again! just wait until you find out the other genetic pre-dispositions from your father that he hasn’t ever told you about! The mind boggles……. Wow! That definitely beats mine! You are a real trooper! I know what you mean though- I will definitely look back on the journey fondly from now on! I feel your pain. All overnight buses should have toilets, because otherwise, not only am I terrified to drink anything for the entire trip, but it means stopping every 3-4hrs for bathroom breaks, and disrupting any remote possibility of actually sleeping. I took an overnight van from Chiang Mai to Vang Vieng in which the seats didn’t recline at all, so we sat bolt upright for 18hrs. The joys of backpacking.